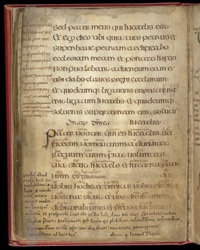 A collection of prayers, hymns, liturgical material, charms, and extracts from the gospels on healing miracles, this prayerbook belongs to a group which, on the basis of their scripts, probably were produced in the Anglo-Saxon kingdom of Mercia during the late 8th and early 9th centuries. It may have been at Worcester Cathedral during the Middle Ages. Like the other prayerbooks, this one gathers the material around a theme, in this case centred upon healing, focusing on the Trinity as healer of mankind. It has been suggested that it was made for a medical person, possibly a woman physician, based upon some feminine word endings in the text. Just below mid-page the Lord's Prayer (Pater noster) begins, highlighted by its initial and meticulously outlined with red dots and infilled with yellow. The line above, originally in red, identifies it as a prayer ('Oratio...'). A 10th-century gloss (translation) in a Mercian dialect of Old English runs between the lines. Another later prayer is written in the lower left margin. Below that a book-collector, John Theyer of Cowpers Hill, Glos., wrote notes, dated 1649. It is easy to see this prayerbook as a long-lived, much used devotional aid.